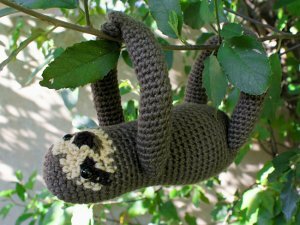 An original realistic crochet amigurumi Three-Toed Sloth pattern by June Gilbank. Sloths live in the rainforests of Central and South America. They live, move and eat very slowly, and spend almost all their time hanging from branches by their specially-adapted hands and feet. My sloth has a pale face with distinctive slanted eye stripes and that never-ending enigmatic sloth smile. His long legs have crocheted-in knee shaping so they don't just look like tubes. His shoulders and hips are jointed (I've also provided instructions for a non-jointed version) and he can hang around like a real sloth thanks to almost invisible hook-and-eye fasteners on his feet (optional, and I've also suggested alternative fasteners). Date Added: 09/29/2016 by Shannon H.
Date Added: 09/23/2016 by Nancy F.
Date Added: 02/05/2014 by monica d.
Date Added: 11/04/2013 by Chrisie M.
Date Added: 09/30/2013 by Angela N.